If you are planning an event with food, make sure to think about your waste. In order for the university to reach its goal of reducing waste production by 3% each year, all Tufts events must divert as much waste as possible (including food!) from landfills. These events are known on campus as Zero Waste Events, and the Tufts Office of Sustainability is available to help you plan one. You may have noticed our Zero Waste Monitors at Matriculation, Commencement, The Fletcher School Orientation, Tufts Graduate School Orientation, Fall Gala, Community Day, Homecoming, International Center Thanksgiving, the Tufts Energy Conference and the President's Picnic. The Office of Sustainability is available to organize large-scale Zero Waste events for crowds over 100 people, and will provide student workers to monitor the Zero Waste Stations. 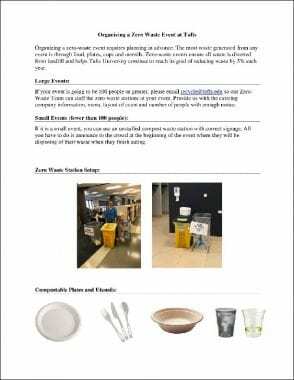 If your event is less than 100 people, but you are still interested in hosting a Zero Waste event, the Office of Sustainability is happy to assist you in organizing one, but does not provide workers and bins for these events. First, read our Organizers Guide to learn more about how to host a Zero Waste event. Then, reach out to the Tufts Office of Sustainability at recycle@tufts.edu and provide us with the expected number of guests and venue well in advance (a month or more before the event is ideal). This is especially important if your event will have 100 people or more. Lastly, if your event is small and you need signage for your waste stations, click here to go to our downloadable signage page. Scroll down to the Zero Waste Event section where you will find a selection of different signs to use. Thank you for taking part in Tufts University’s sustainability initiatives!